Iconic Mt. Hood and the surrounding National Forest provide year-round excitement for explorers from near and far. 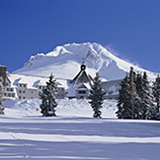 From Highway 26, take the Timberline Highway to the historic Timberline Lodge. If you’ve never stepped inside the legendary lodge, take some time to look around. Upslope from the Timberline, a permanent snowfield sits atop the Palmer Glacier where skiers can get in turns year-round. For awesome views of scenic Mt. Hood, pick up the Timberline Trail from the lodge. The Timberline Trail—which is a portion of the Pacific Crest Trail—is a 38-mile back-packing trip but you don’t have to stick it out for 4 days of mountain trekking if you didn’t come prepared. Hike along the Timberline Trail for a mile or two to enjoy the beauty of Oregon’s tallest peak, and then turn back towards Timberline Lodge when you’re ready to continue on your journey. If you’re in the mood for hike through one of the Pacific Northwest’s temperate rainforests, take a turn off Highway 26 in Welches, OR to pick up Salmon River Road. From here, you’ll reach the Salmon River Trail Head, which offers a 7.8-mile hike through the protected Salmon-Huckleberry Wilderness. Wander through a lush old-growth forest ecosystem as you follow the Salmon River. As the trail continues, you’ll climb away from the river and begin an ascent towards a high bluff, which offers a magnificent view of the Salmon River Gorge. From this viewpoint, the trail traverses across a slope, before two switchbacks loop you back to the main trail. Backpackers can continue upstream for camping, but day hikers turn left here and follow the trail downstream back to the trailhead to finish out a perfect day-hike. Behold commanding waterfalls and idyllic canyon scenery as you travel up the Columbia River Gorge. Take I-84 East from Portland, OR and venture up the Columbia River Gorge. As the interstate takes you along the Columbia River, behold the Gorge. Rich with geologic history from the Missoula Floods and cultural history from the First Peoples who first lived in the Gorge area, the Columbia River Gorge is one-of-a-kind. To continue on your mission to Multnomah Falls, stay on I-84 until Exit 31. 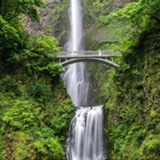 At this left-hand exit, it will be easy to see that you’ve reached your destination, for the magnificent Multnomah Falls is easy to see from the parking lot off Exit 31. 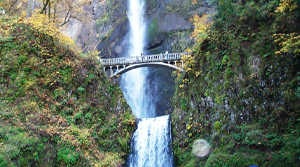 Once you park, stroll down the paved trail to the falls, past the Multnomah Falls Lodge, and reach the base of the falls. Crane your neck to gaze upwards as 620-feet of water comes cascading down, headed toward the Columbia River. Continue along the trail and walk across the iconic Benson Bridge for an excellent vantage point of the fall’s top tier. Take in the sight of the famous falls, stop by the interpretive center, grab a bite or a souvenir at the lodge, and then head onwards to continue on your epic trip. Keep heading east on I-84 until you reach Exit 40, for Bonneville and Tanner Creek. 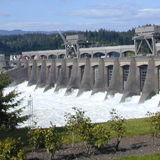 The Bonneville Lock and Dam spans across the Columbia River, and serves as a hydroelectric power source for the region. In addition to being an electrical power generator, a large, operating fish hatchery is featured at Bonneville. Visitors to the fish hatchery can gaze upon large display ponds were fall Chinook, spring Chinook, coho, summer steelehead, and winter steelhead are reared at different times during the year. Year-round features of the hatchery include trout ponds, where visitors can purchase a handful of food for a quarter, sprinkle the food into the pond, and watch the large trout dart to the surface and swipe a snack. In addition to trout, visitors can view a fish that has inhabited this earth for 200 million years: White sturgeon. Come see these amazing, prehistoric fish that weigh upwards of 400 pounds. 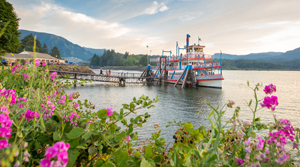 After you’ve had your fill, continue east on I-84 and find lodging and food in Cascade Locks, OR. Nestled next to Columbia River, Mt. Hood serves as a backdrop for Hood River, OR, a place that exists for those who seek adventure. Stay on I-84 East and you will inevitably reach Hood River, OR, a town full of outdoor enthusiasts and a place with a unique agri-tourism scene. 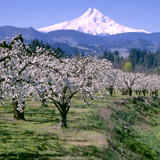 Take the Hood River exit and explore the Hood River County Fruit Loop. Enjoy a drive across 35 scenic miles of Hood River farmland on a self-guided tour which you can complete at your leisure via car or bike. Find a map of the Fruit Loop online [hyperlink here], or pick one up on your way through town at the Chamber of Commerce. Follow the route past farm stands, wineries, and u-pick farms, which are sprinkled across the rolling landscape of the Hood River Valley. Holding the most d’Anjou pear orchards in the country, the Loop will lead you past orchards of not only pears but, apples, cherries, and fields of other crops. Stop in at a farm stand for local produce, handmade gifts and homemade jams, or swing by a winery to taste an award-winning bottle or this year’s vintage. As you circle back around on the Loop, head back into town for five-star cuisine and craft beer. During your visit to Hood River, chances are you’ll see colorful sails and kites gliding across the Columbia River. Hood River, OR is an international hub for windsurfing and kiteboarding due to frequent winds and wide waters. If you land in Hood River on a day where the wind is blowing and conditions look good, there are many places to rent gear and take kiteboarding lessons. However, if you are in town on a windless day, or if you’d rather pursue a watersport that takes less instruction, stop by a shop to rent a paddle board. Stand-up paddle boarding (SUPing) is a rapidly growing sport which those is the Hood River community have quickly taken to. 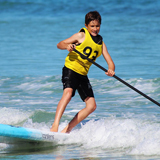 SUPing involves little instruction, and just a bit of balance on your part. 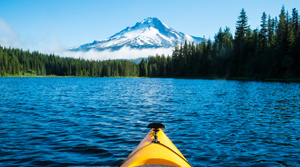 Paddling out on the Columbia River on a SUP board allows you to take in the Gorge, Hood River, and views of Mt. Hood and Mt. Adams from a peaceful, natural vantage. The sun shines in a place that people of the Columbia River Gorge Basin have flocked to over 10,000 years. The Dalles, OR is a place to find history, culture, and recreation. The Dalles, OR sits along I-84, and serves as the eastern gateway to the Columbia River Gorge National Scenic area. While the shore of the Columbia River borders the town, The Dalles is a special place for professional anglers and casual fisherman not just because of the mighty Columbia. The Deschutes River, John Day River, and Klickitat River are all within 30 miles of The Dalles, with each of these rivers offering world-class fishing. On the Columbia, The Dalles Pool stretches from The Dalles Dam to the John Day Dam. The stretch of river is famous for year-round walleye fishing. 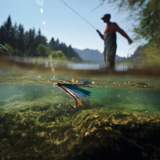 For a guided fishing tour on the Columbia River or neighboring tributaries, find contact information and a list of guided angling services here [insert hyperlink to DMO] or stop by the Dalles Chamber of Commerce on your way into town. If you’ve come to fish with your own gear, just be sure to acquire an Oregon Fishing License heading out to cast a line. After a day on the water, head back into town to find great food and a comfortable bed at the many popular restaurants and accommodating hotels. The Dalles is an unexpected oasis from the cloudy skies and rainy weather in more western parts of the state. 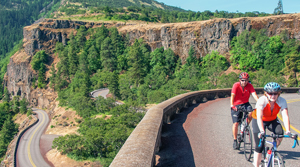 With 300 days of sunshine and 14 inches of rain a year, The Dalles offers perfect rides for cyclists with dry pavement, sunny weather, and open roads. There are many biking loops around The Dalles that lead you through wide open spaces and orchard-covered lands. The Petersburg School Loop is a 28-mile ride, which offers views of rolling wheat fields, taking you through quiet country, where you might see local birds or wildlife but not many other people. 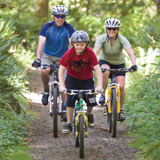 Another ride, the 17.6-mile Cherry Heights Loop, brings riders along winding and smooth farmland roads and offers pristine views of the Columbia River. Pedal back into town and reward yourself with a glass of wine from a nearby vineyard or dinner made with local ingredients.